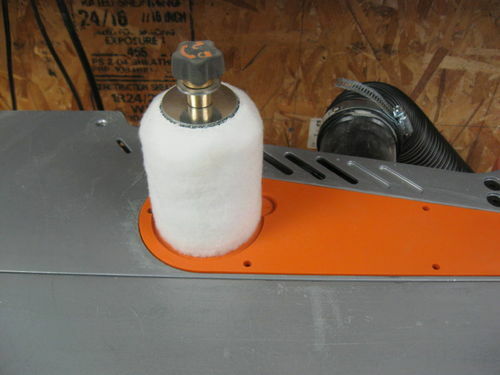 My latest edition of ShopNotes featured a tip sent in by a reader for buffing parts. 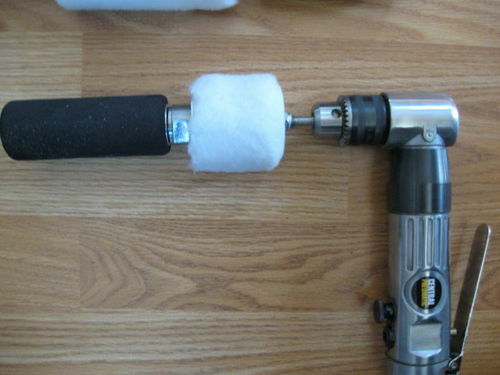 Notice that he used his 1 1/2” Φ hole saw as a mount for a section of paint roller sleeve. 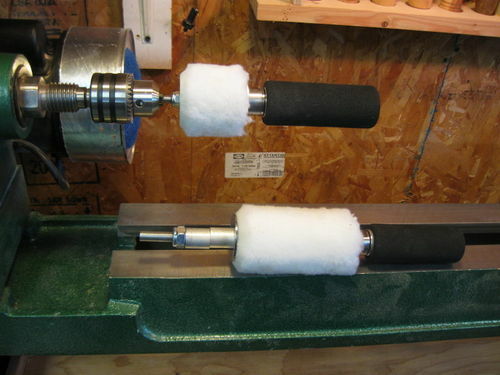 I tried this and it will work, but me being me, I wondered if this would work better if the section of roller were mounted over the 1 1/2” Φ rubber drums of both my Rigid spindle sander and the small drum of my drill mounted drum. Since these drums expand the sleeves would not slip while buffing. My Rigid drums are 4 1/2” long which made it perfect for cutting a typical 9” paint roller sleeve in half. 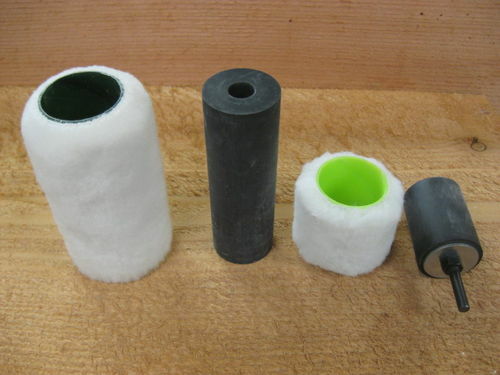 Another typical length of paint roller is 4” which when cut in half is ideal for my 1 1/2” Φ by 2”long rubber drum. 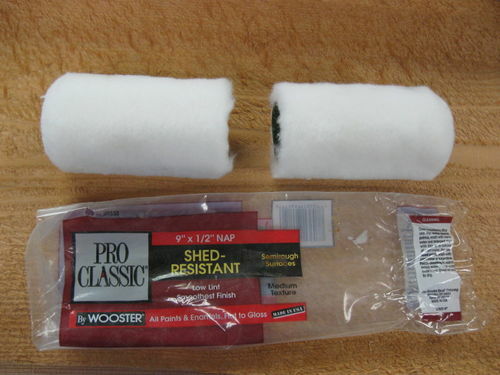 Beware that the paint roller sleeves fit tightly over the rubber drums. To help with this I sprinkled baby powder over the drum before mounting the sleeve. Here are a few transition pictures from the sanding to buffing option. 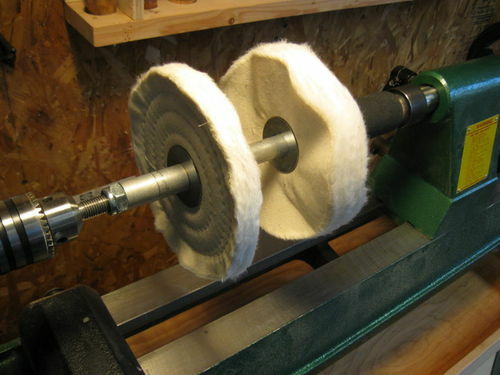 I was only able to use paint rollers with a 3/8” or 1/2” nap with my Rigid spindle sander because of the the guard diameter but I could use a 3/4” nap on the smaller drum. This tip also gave me yet another option to present when promoting the two mandrels I posted in my last blog. Because of their versatility,I have decided to name these two mandrels the, “Multi-task Mandrels”. What do you think? I hope that you will find this tip of some use in your shop. Thanks for looking. As usual, your comments and suggestions are always welcome. Great ideas. I think Iʻll adopt them. Thanks for sharing. tyvekboy, let me know how this works for you. 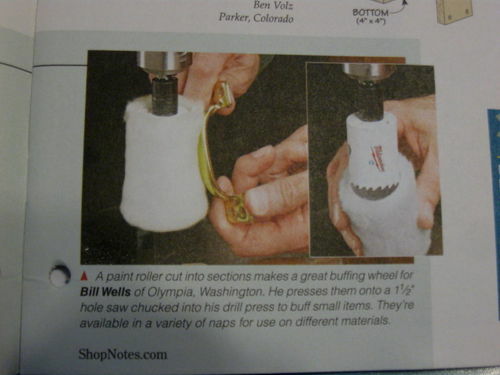 Perhaps you can post a few pictures of you buffing out some of your amazing Intarsia pieces. Great idea! You’re like the innovator’s answer to the Enigizer Bunny”: The Inventor Who Never Runs Out of Ideas. Thanks for sharing and it looks like you’re on your way! good idea. 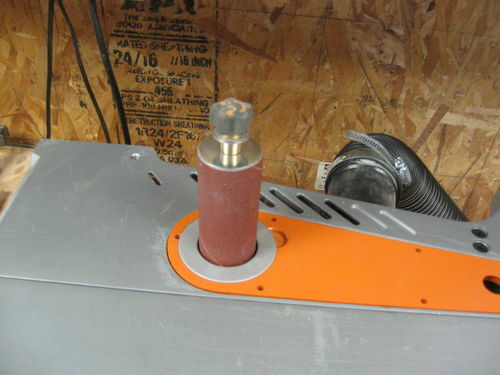 I might try that on my sander. 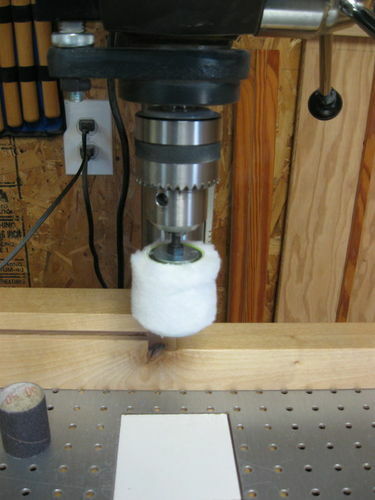 I have turned a piece of pine down and slid a roller on it and used my lathe it works well for that. Lots of great options. Will you be using 3 buffing pads for Tripoli, White Diiamond and Carnubla wax like the Beall system? Thanks John I appreciate your comments and good advise. 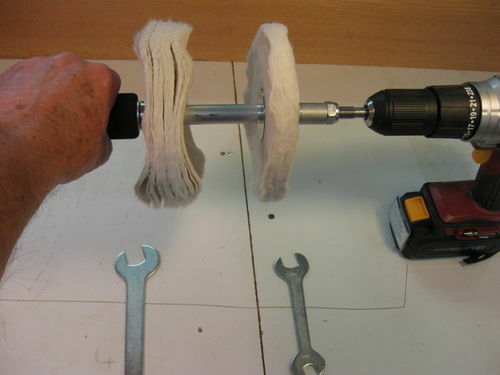 Bruce, turning a dowel is certainly another great option for accommodating the paint rollers. Jim, the beauty of my mandrel is that you can set it up any way you like. 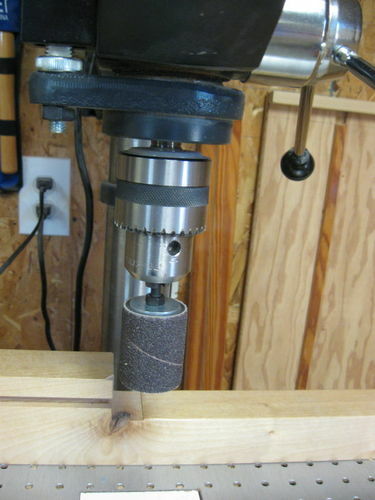 It is designed to be both mobile or lathe mounted. That being said, the mandrel for the Beall system is single purpose, longer by design, and will support three buffing pads comfortably. The two photos shown below are just a couple of ways one could set up the larger of my two mandrels. 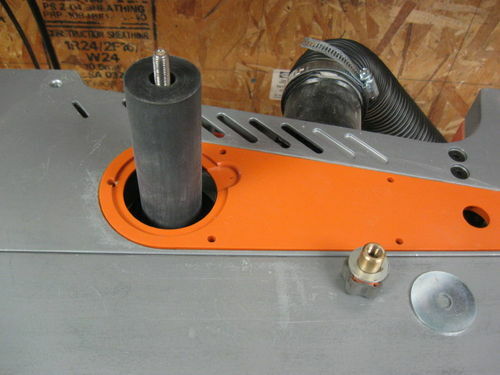 I like the idea of taking the buffer to the workpiece instead of vice versa. But I wonder if the nap on rollers is long enough to be effective for anything other than polishing hardware, as shown in the tip. 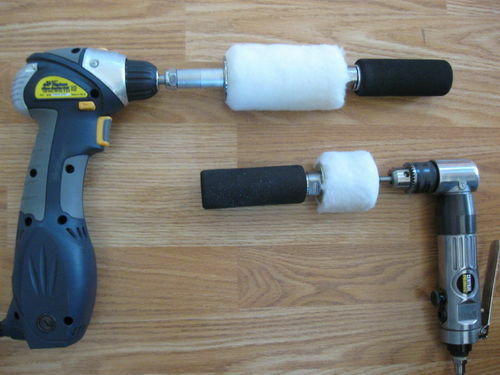 Rather than using any Beall products, I’ve been using car buffers chucked into my hand drills. Lee, this is a great idea. I’m going to try this on my next project. It will definitely make some sanding options easier. 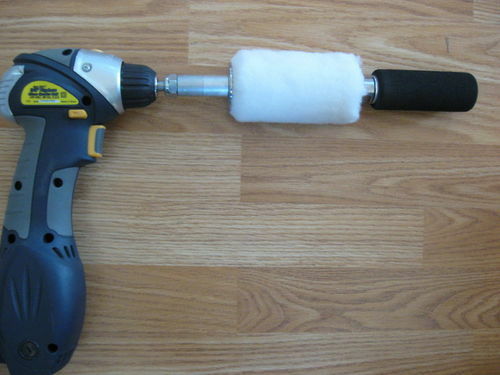 John, I really don’t know how effective paint rollers will be as buffers. I just thought the idea was worth pursuing to see where it lead. Gotta give it a try :). Dave, let me know how this works for you. Really good stuff Lee. Ya gotta luv shop notes as well.